I spent last week in my home state of Idaho enjoying time with my family and the beautiful fall colors/weather. A few of those days were spent at the Quilt Taffy Craft Retreat in McCall. My mom and I had a great time together and I should probably be sharing pictures from that, but I didn't take any! So follow the link if you want to see all the fun things we did. One evening we had a demo on cupcake decorating. We used this method to add chocolate shapes to our cupcakes. I thought it would be the perfect addition to the cupcakes I was planning to make for bake group this week. Here are my results. The cupcakes are pumpkin with brown butter frosting and oh so yummy! I've been thinking a lot about Autumn and Autumn baking (of course we are still experiencing 100+ degree weather, but my northern born inner clock tells me that Autumn is nigh). Of course that makes me think of delish dishes made from pumpkin- my fave. Which leads me to think about Pumpkin Day and my dearest friend Alyson. And then I realized I had never shared this tradition on this blog, so I'm re-posting the story from my private blog, for your reading pleasure. 1. a day set aside for the making of all things from a usually large pulpy deep-yellow round fruit of the squash family: generally observed on the first Saturday in November, excepting that day be All Saints' Day in which observance is held on the second Saturday in November. 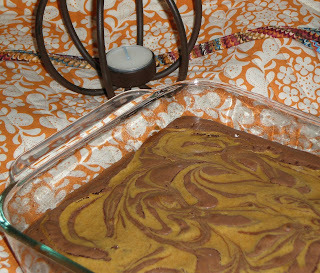 2. celebrated by roommates in aprons, who boil, puree, and bake pumpkin into edible delights. 3. commemorated by two women opening a can of pureed pumpkin, hastily throwing something together, before the baby wakes up. I'd like to tell you a story about two college sophomores, for the sake of anonymity lets call the first one Alyson and the second Nancy. We will have to travel back in time... November 2003... Alyson and Nancy were roommates and had some time on their hands (or didn't have dates to the school dance). Alyson expressed an interest in baking something from an actual pumpkin. The girls foolishly assumed they would be able to find a pumpkin the weekend after Halloween. 4 stores later they acquired two small baking pumpkins. Add some internet recipe searching, whole nutmeg and a little determination and the seeds of Pumpkin Day were planted. That first Pumpkin Day was fraught with difficulties, but these two would not be deterred. They boiled, baked, steamed, microwaved, smashed, and pureed those pumpkins. They pounded the walnut sized nutmeg into powder... with a hammer (or was it a big rock?). Neither died from the horrible pumpkin soup. And the pie was good enough that their other roommates were willing to indulge. For the next 3 years the tradition held despite boyfriends, marriages, and illness. In fact the only thing that seemed to deter pumpkin day was distance. But in the end that could only delay the inevitable for a year. From Arizona Nancy traveled to Missouri to Alyson's home to ensure that the tradition did not falter. 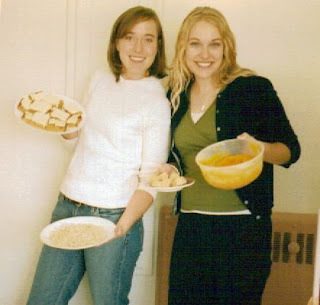 Times had changed for these two friends and although they opened a can rather than a gourd and they had to take a break to feed a baby and only one dish was made instead of many, Pumpkin Day was once again celebrated! Moral of the story, don't start such a tradition that is so much work with someone, unless you really like them, their husband, their child and their future children. Preheat oven to 350 degrees. Lightly butter a 9x13-inch baking dish. Prepare pumpkin batter: In a small bowl, using an electric mixer, beat butter with cream cheese until smooth. Beat in sugar, scraping bowl occasionally. Beat in egg, then add pumpkin puree, vanilla, cinnamon and ginger. Stir in flour. Prepare chocolate batter: Combine semisweet chocolate and butter in a medium bowl. Set bowl over saucepan with 1-inch of simmering water and stir occasionally until melted. Remove from heat. In a separate bowl, combine eggs with sugar and vanilla. Beat at low speed until light and fluffy- about 4 minutes. Using a large rubber spatula, fold in melted chocolate. Sift flour over the batter and fold it in just until combined. Spread chocolate batter evenly in prepared pan. Using the back of a butter knife, swirl the pumpkin batter slightly into the chocolate. Bake for 30-40 minutes, until a toothpick comes out clean. Finally after all these ages I actually have something to post. Well, that is a misrepresentation, because I've been making stuff, I just haven't actually gotten around to taking pictures and posting about them. Case in point- these minis have been done for at least a month and I only just took pictures of them. Minis are fun- give you a chance to try out different techniques, work with scraps and they are done so quick! The first one is made from all the Harmonies fabric I had left over from the shower curtain I made a few years ago. It measures 22 inches square and is listed in the shop. The second I made with the scraps from Kennedy's crib quilt that my mom made. They were all triangles and I enjoyed trying out a new technique- a chevron design from triangles. Although I have to admit that I don't love piecing triangles and probably wouldn't do it again. It measures 20 inches square and Kennedy has claimed it for her doll/stuffed animals. 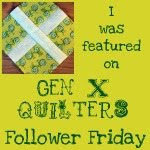 Last but not least is this little selvage quilt. I really love creating blocks from selvages and these were so quick and easy. Each square of selvages was 4 1/2 inches. I also did something different with the quilting- straight horizontal and vertical lines grouped together. I love how it turned out. This one measures 22 x 26 inches and is listed in the shop. I backed all of them with a sheet, it is Roxy brand and thick but still silky smooth. Oh, and one more new technique- I experimented with sewing the binding down by machine, at first it did not go very well, but by the third one I started to get the hang of it. So, hooray for quick little finishes and trying new stuff! I wasn't sure I would ever be able to write this post. This quilt was quite nearly my undoing. Everything went fine until 3/4 of the quilting was finished and I discovered the most horrendous puckers! And at that point it was either unpick all my quilting, splice, or discard. It threw me into a complete sewing funk. So I tossed it in a corner and ignored it for about six months. Then my mom stepped in and helped me figure out the issues, and voila a finished Fandango quilt. My favorite part of this quilt is the quilting through the patchwork. Actually I made this quilt specifically for the quilting. I love how quilting in the negative space makes the colored blocks pop. And the back, which was fun! Hooray for another one crossed off the list. I've made a few of these rings but hadn't thought of posting about them on the blog, until a friend suggested it. So I thought I'd put together a little tutorial of how I make them. Start with one uncovered button and back. Remove the metal loop on the back. I do this by wiggling and moving it around until it slips out, you could also use needle nose pliers. Cut a circle of fabric the size indicated on the cover button box- if you have an image be sure to center it in the circle. Then create the button (if you haven't done this before, the box that the cover buttons come in has good instructions). As you do this be careful to keep your image centered- which is more difficult than you'd think- as you can see, my elephant isn't perfect, but I've had worse. Now grab your ring blank and heated hot glue gun. I squeeze enough glue into the back of the button to fill it, but not overflow. Then press the ring blank pad into the hot glue and hold until cooled. There, you have a darling custom make ring. Now, go forth and make 1... or 4! Obviously I'm not a hand model, but I wanted to include this picture for perspective on the size of the button. I know that Easter has past, but I just had to share this cute garland I finished, based on this pattern. I had a great time using up little scraps/selvages and arranging them to create these darling spring time shapes. I used Osnaburg linen for the back ground. I'm pretty partial to this little bunny. Especially that little white dot of a tail and wee little bow. I also love the carrot, such a fun little shape and color combinations! The egg was the simplest to make. I added a bit of trim to the bottom of each piece and some ribbon to hang them. Not sure I love the ribbon, it's a bit on the bright side, but oh well. And finally a little chick. Stitching around the shapes and border went really quick and was fun, I think it helped that I didn't worry too much about the stitches being perfect. So, Happy Easter (next year)! Whipped up this darling Easter basket, from a paper grocery sack, with the help of this tutorial. I made mine bigger than the tutorial (8x8 bottom and 4 strips around the sides) to fit a few more eggs. Mostly she just wanted to eat the candy. I am from Idaho, went to college in Utah, and now live in Arizona. I am married to an awesome guy who works as a financial advisor. We have a daughter named Kennedy.